Tom Bombadil and Goldberry (Lady Geneve, Red Box Games) (Jewel of July ’18) | Azazel's Bitz Box. 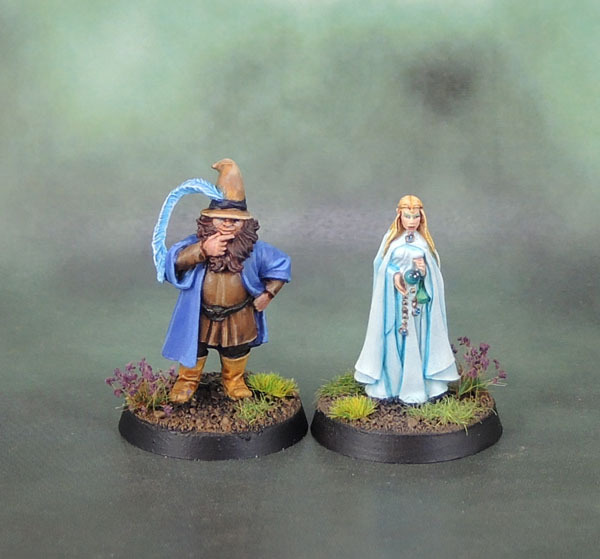 This entry was posted in Lord of the Rings, Monthly Painting Challenges and tagged Citadel Miniatures, Lady Geneve of the Council of Seven Speaker of the Far Stars, Lord of the Rings, LotR SBG, Red Box Games, Strategy Battle Game, Tom Bombadil. Bookmark the permalink. I was worried when i saw this that you were going to fond of old Tom. My wife read Lord of the Rings to me when we went camping and i remember to condusing and unrewarding encounter with Tom. I mean, its a pretty unneccesarally wordy book anyway… But that bit was a whole other thing. Yeah, I think Tom works fine as an NPC in Lord of the Rings Online (which I played a bit a few years ago) and as a tabletop miniature which is completed that I don’t need to worry about. As a character in the books or worse yet – the films. Notsomuch. Despite having last read Lord Of The Rings about 20 years before the films (!) even I noticed that the Tom Bombadil encounter was missing from the films! But you’ve done a really nice job on these two I have to say and that’s put faces to names for me! Thanks, JNV! Yeah, I had the same moments when watching the films, expecting them to go into The Old Forest …and then they didn’t! Ah, old Tom – a fine bit of whimsy if we’re being generous to J.R.R… The mini is a bit of a duffer as well, so I can see why you weren’t that fired up about him! Still, he came out decent mate, and nice work proxying in for Goldberry – she’s rather lovely in her soft white robes! Yeah, he’s one of those figures that is a trial to paint for one reason or another, but now that he’s done… well, I still don’t *like* it, but I’m satisfied with it, and that’s good enough! I’ve been curious about using Red Box Games’ elves alongside my LotR elves, but wasn’t sure about the scale. She looks great alongside Tom. I think she’d make an excellent Celebrian, wife of Elrond, mother of Arwen and daughter of Galadriel. Yeah. the Red Box models fit in pretty perfectly with the GW LotR models. The elves, dwarves, humans and halflings in particular. I’ve done a few size comparison posts that you can check out if you like. Tre’s prices are unfortunately not army-building-friendly, otherwise I might have put together (or bought) a small force of Lake-Town Men proxies. On the other hand, they’re well prices for characters, so have at it! I think she’d work nicely for Celebrian. I might be in the minority, but I did wish old Tom was in the films! These two are indeed worthy of Jewel status. Goldberry is radiant and so unbelievably well highlighted – white is a tough color to pull off, but man you did it. TB (Tom Bombadil – not Tom Brady 😁) looks the part. Nice pair! That’s fine Mark – we don’t all need to agree on things like that. I’d have been happy for a shorter, more edited appearance with less twee singing and the Barrow-Wights’ scene. Thanks on Goldberry, admittedly I took my colour cues from the GW model, but I’m very happy with how the dress turned out – and Tom – as a model – is now ..fine. I am with Mark on this one, I found Tom enjoyable and did not understand why they did not include him in the movies, seeing as other stuff is in the movie that did not happen in the books… I still say job well done tho. Very nice work on spotting Lady Geneve as a potential Goldberry. Her “example” paint job is so different that I’m not sure I would have seen the possibility there. Really, I think she works much better than the GW sculpt for her. 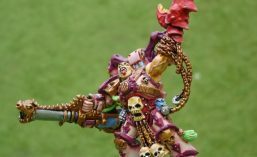 I’m having trouble putting my finger on it, but your paint job makes that Bombadil sculpt look way better than GW’s. I think it might be that they try to over-emphasize the face, beyond what the sculpt can support, and he ends up looking sort of like a troll from one of Wil Huygen’s books. You let his eyes be hidden under his hat brim, and didn’t highlight the messiness of his beard so much, and he ends up seeming much more like a nice fellow. Ah, yes, it would be easier to see other possibilities in the bare metal. I think it was also how ruddy they made his face that contributes to making his eyes look way too creepy. I suspect they were going for rosy-cheeked, but with so little of his face visible, the vibe there gets totally thrown off. That’s certainly true! It looks way too …odd. The moustacheless beard adds to the odd overall effect as well.